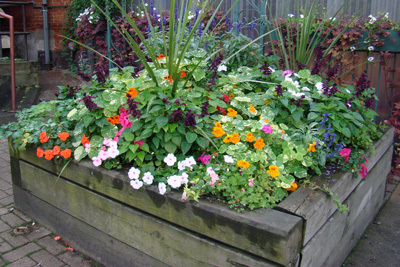 Parkdale Green Thumb Enterprises (PGTE) is a social enterprise horticulture business that installs and maintains outdoor and indoor plants for Business Improvement Areas (BIAs), non-profit organizations, hospitals, the private sector and community groups. We also provide groundskeeping services for the non-profit housing sector. PGTE was established in 2001, and is a partner of Working for Change (Ontario Council of Alternative Businesses). spring and fall clean ups. PGTE also provides interior installations and plant maintenance. We will recommend plants to accent an office’s architectural features, and respond to particular lighting conditions. We also see to ongoing plant watering, pruning and fertilizing to maintain the health of your plants.